Oscar Night America: Come and Gone! NOTE: The 85th Annual Academy Awards has come and gone. I made some revisions to reflect what transpired on Oscar Telecast 85 as the events unfolded on TV. This blog entry was originally written on Saturday, 23 February 2013, the day before the Academy Awards. It's that time of year again! The grandaddy of all awards shows on TV, the Academy Awards (a/k/a The Oscars), is just around the corner! The fun starts on Sunday, 24 February 2013 at 7 PM ET (4 PM PT for our Los Angeles/San Diego friends) with the Oscar pre-show and the excitement begins with the actual Oscar telecast starting at 8:30 ET, just like getting on the on ramp onto Interstate 275 in the Tampa Bay region. You can find all the Oscar excitement as close as your ABC affiliate; here in the Tampa/St. Petersburg area that would be ABC Action News, WFTS-TV on Channels 11 and 1011 for us Tampa/St. Petersburg residents who are connected to Bright House Networks and over the air Channel 28 for the traditional over the air folks. 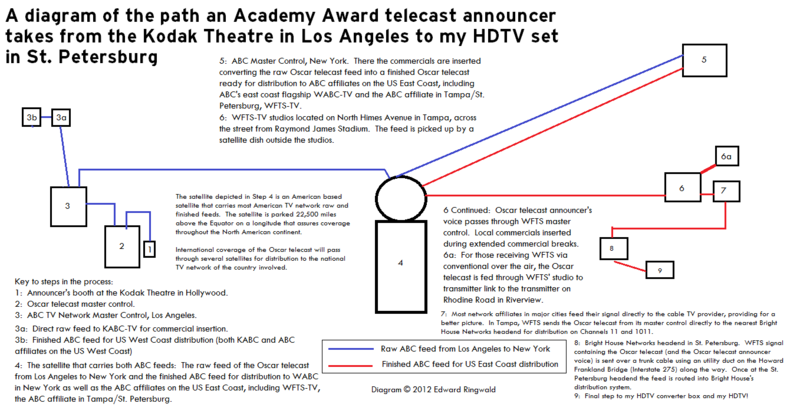 For the past two years, I put together a step by step diagram of the technical aspects of the Oscar telecast, especially the electronic route the voice over announcer from the microphone in the announcer's booth over at the Dolby Theater in Hollywood to my HDTV set here in St. Petersburg.﻿ Here's a pictorial diagram that I drew up last year you can view, both in PNG image format and in PDF. After all, an Oscar telecast announcer's voice travels at least 44,000 miles thanks to all that satellite uplinking and downlinking between Hollywood and Tampa, not to mention a ride on Interstate 275 from the Bright House Tampa headend to the Bright House St. Petersburg headend on a utility duct. Now if the Oscar telecast is being shown internationally (and the Oscar telecast is shown to plenty of countries around the world, indeed) ABC's finished Oscar feed for distribution to ABC's affiliates is also uplinked to various international satellites for distribution on a country's television network. Whether the telecast is shown live or on a tape delay basis is up to the international broadcasters themselves; what usually drives this decision is what time it would be locally when the Oscar telecast is on and the language translation. For instance, when 8:30 PM ET Sunday night rolls around and the Oscar telecast announcer intones, "Live from the Dolby Theater in Hollywood! The Academy of Motion Picture Arts and Sciences presents the 85th Annual Academy Awards! ", it would be 2:30 AM Monday morning in Ljubljana, Slovenia - who would be staying up into the wee hours of the morning to catch the Oscar telecast? For that reason, most international broadcasters will probably carry the Oscars live and then replay the Oscars at some much better and more convenient time for viewers. Speaking of Oscar No. 85's telecast announcer, if you think Tom Kane is doing the announcing duties, you are wrong. The Oscar telecast has another new voiceover announcer on the block, and that happens to be Cedering Fox, according to this Kansas City Star article I recently found. Cedering's claim to fame, as reported in the article, was having the voiceover announcer duties for the 2008 Democratic National Convention - the same convention that gave Barack Obama the Democratic Party's nomination and ultimately the office of President of the United States. Being given the task of being the announcer for an Oscar telecast is a major achievement of which a voiceover announcer can be proud of. In fact, being an Oscar telecast announcer is a voiceover announcer's Holy Grail. Which leads me to think: Would one of our own voiceover announcers at Tampa's major network affiliates become a future Oscar telecast announcer someday? As for Tom Kane, I think he deserves a break after being the announcer for so many Oscar telecasts. Besides, he did two consecutive Oscar telecasts, 83 and 84, with 84 being co-announced by Melissa Disney. Besides, the producers of the Oscar telecast want a new look and feel to each telecast twofold: First, so that the Academy of Motion Picture Arts and Sciences can get their maximum return on their investment, and second, try to beef up the ratings on ABC. And according to the Kansas City Star article I mentioned earlier, Tom Kane mentioned that Cedering Fox will do a great job. And I think Cedering will. As for Cedering Fox, she is always welcome in my home on Oscar night on ABC, especially when she says this: The 85th Annual Oscars will continue in a moment here on ABC. And if there was an Oscar category for Best Oscar Telecast Announcer, it would go to the announcer of the 85th Oscar Telecast, Cedering Fox. When I was watching the last hour of the Oscar Telecast I noticed that the host of Oscar Telecast 85, Seth McFarlane, was stealing the announcing show in a few spots. But all in all, Cedering did a great job - her announcing was clearly understandable and, like I mentioned earlier, Cedering was a great house guest in my home when I was watching the Oscar telecast on my HDTV connected to a digital cable box. With that said, Oscar Night America - and Oscar Telecast 85 - is now in the history books, to be unburied again when Oscar Telecast 86 happens in 2014. Perhaps who will be the telecast announcer for Oscar Telecast 86? Tom Kane? Who knows, but that decision is up to the Oscar telecast producers. Recently I came across a website for those of you out there that like TV station promos and news opens. It's called SouthernMedia's News Music Search Archive, where you can listen to news opens and promos from not only our TV stations in the Tampa Bay region, but TV stations in not only surrounding but outlying metropolitan areas across the country as well. It's well worth a look - you'll spend hours listening to promos from TV stations across the country, both current and historical. Here's the roster of the Tampa Bay Network Affiliate TV Stations Voiceover Announcer Club, as of January 2013 (source for station announcer information: SouthernMedia's News Music Search Archive, Tampa/St. Petersburg TV Market Page). As you will see, only the four network affiliates - NBC (WFLA), ABC (WFTS), CBS (WTSP) and Fox (WTVT) - are shown here as well as Bright House Networks' Bay News 9. WFLA-TV has been the Tampa Bay region's NBC affiliate since 1955. WFLA-TV has survived the Great Tampa Bay Network TV Affiliation Switch of 1994. The newest voiceover announcer on the block in the Tampa Bay region, Scott Chapin has plenty of voiceover experience. His recent voiceover experience was that at WSVN Channel 7 in Miami, and according to my research Scott Chapin is the most sought after voiceover announcer for TV stations nationwide. Not only Danny Harmon does voiceover for WTVT Fox 13 as well as WKMG Channel 6 in Orlando, he is also an avid railfan too! You need to check out his channel on YouTube; his YouTube name is distantsignal and you will have hours of railfan fun! Yet another well known voice over announcer, Paul Turner has been the voice of Bay News 9 right from the beginning when Bay News 9 went on the air in September 1997. Paul Turner can also be heard on many other TV stations throughout the country, including WSVN Channel 7 in Miami where he is the current voice over announcer there. 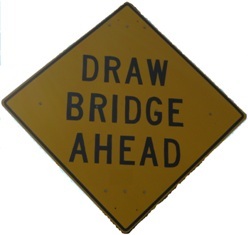 To those of you in the Miami/Ft. Lauderdale area that miss Scott Chapin doing the voiceover announcer duties on WSVN, you got a great voice over announcer bringing plenty of Tampa area flair (translation: Many years of Tampa experience) down to South Florida. If you WSVN viewers out there in South Florida really miss Scott Chapin so much, just head north either via Alligator Alley and Interstate 75 or Amtrak's northbound Silver Star (Train 92) to Tampa and tune in to WTSP 10 News. And there you have it - the roster of The Tampa Bay Network Affiliate TV Stations Voiceover Announcer Club as of January 2013. Stay tuned!